Using native virtual machine (VM) reporting tools to track activity across your VMware environment just doesn’t cut it. Because even a small change to system configuration or ESXi/ESX server permissions can threaten data security or business-critical processes that your organization depends on, you need to spot and remediate issues in seconds, instead of pending hours digging through cryptic logs. With Netwrix Auditor for VMware, you can address security threats far more efficiently. Insightful reports enriched with actionable security information and available at any moment provide the 360-degree visibility into changes across your virtual machines you need to identify and block potential threats before it’s too late. To keep an eye on events across your VMware vSphere, vCenter Server or standalone VMware ESX/ESXi hosts, you can use vSphere Client. The Events tab in this ESXi/ESX reporting tool provides a list of logs with activity that happened in your VMware infrastructure. However, you can view the events from only a single virtual machine at a time, for instance, in an ESXi/ESX report. Plus, prepare to have your patience tested, because VMware reporting tools like this require you to manually sift through logs in order to view actions in detail and detect aberrant user activity that needs your immediate attention. To top it all off, lack of report delivery options makes report generation inconvenient and increases the risk that you won’t notice critical events in time. 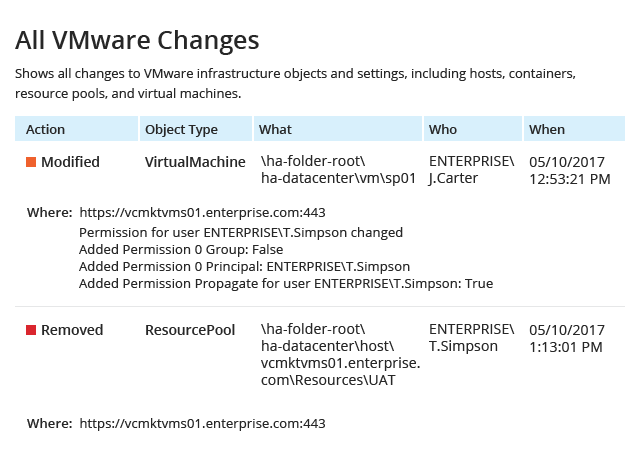 Easily get all the critical details about every change to VMware inventory, virtual machines, vCenter servers clusters and more. Slash report preparation time by subscribing to the reports you need most and getting them automatically delivered to your inbox on the schedule you specify. Quickly get to the root cause of performance problems by digging deeper into recent changes with the Google-like interactive search. Remediate threats faster with alerts on critical activity. Retain your VMware audit data securely for over 10 years in a two-tiered (file-based + SQL Server database) storage for later review or for your next audit check.